deBebians designs and manufactures a huge collection of bridal and fashion jewelry. One of our most popular collections is our gemstone eternity bands. This exclusive section features a multitude of gemstone or diamond and gemstone options. We carry various carat weights, setting styles, and diamond qualities. One of the most popular gemstones is the blue sapphire. It is highly renowned for its distinctive color as well as its durability. This magnificent gemstone scores a 9 on Mohs scale of mineral hardness, making it an ideal candidate for jewelry that will be worn every single day, such as a wedding band. 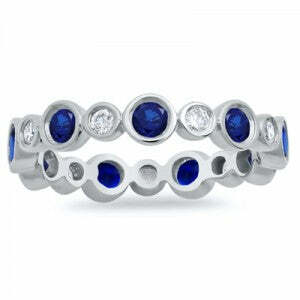 Listed below are three of our most popular sapphire eternity rings that are currently available from deBebians. This shared prong eternity ring is one of our most timeless and classic styles. The ring is set with approximately 0.70 cttw of G-H color I1 clarity diamonds and AAA quality blue sapphires. The stones are round brilliant cut for maximum sparkle and color while the width of the ring is 2mm. This ring pairs beautifully next to an engagement ring, additional stackable rings, or it may be worn alone. Alternating diamonds and blue sapphires give this ring classic appeal while the bezel setting modernizes the overall look of the ring. The ring features approximately 0.50 cttw of AAA quality blue sapphires and approximately 0.20 cttw of G color VS clarity diamonds. The ring will create a dynamic look if worn alone or paired with additional rings. Princess cut diamonds in a channel setting have a clean, sleek look. 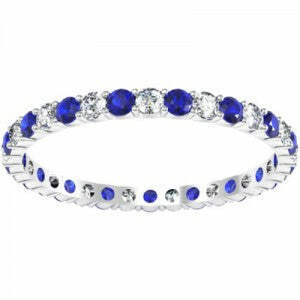 We use AAA quality blue sapphires that have a total carat weight of approximately 1.00 cttw. The ring has a width of approximately 2.5mm. 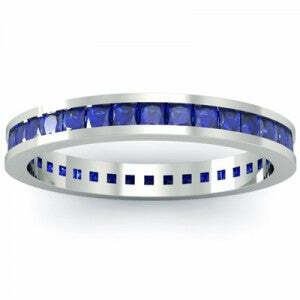 If you adore princess cut blue sapphires and a contemporary eternity band, this is an ideal choice. Please view our entire collection of gemstone eternity bands to see all of our available styles. We offer various precious metal types and finger sizes to make it easy to create the ring of your dreams.